Here, in the first part of a two-part interview, Davies talks with M. Lynx Qualey about how this text came to be—born, in 1850, of a relationship between a Frenchman and an Egyptian—the relationship between the text’s two genitors, and the difference between the Arabic edition and the French translation. M Lynx Qualey: I assume you first heard of In Darfur from Ahmad Faris al-Shidyaq. When did you first read it, and what brought you to the decision to translate it? Humphrey Davies: Yes. Al-Shidyaq criticizes it in the addendum to his Leg Over Leg in which he goes postal against French Arabists because one of them (a Ukrainian, in fact) makes the ill-judged claim that the latter could teach the scholars of the East a thing or two about their own literatures and languages. Al-Shidyaq’s outburst is a kind of first blast of the mizmar against the monstrous regiment of orientalists, and he holds Nicolas Perron—a Frenchman who was the instigator, producer (in the most literal sense: he wrote it out in a lithographic edition) and in some sense editor of the book—responsible for the canards in its spelling and grammar, of which he cites a representative but by no means exhaustive list of twenty-seven. One can hardly blame al-Shidyaq, but he fails to recognize the special circumstances of the book’s creation (see below) and that Perron did not work in a spirit of arrogant criticism. On the contrary, he speaks of the book as though it were an act of homage to “his shaykh,” as he calls him. My desire to translate In Darfur was probably triggered by the diversity signaled in the book’s subtitle, In the Land of the Arabs and the Blacks. Today, when many parts of the world, including the Arab countries, are undergoing a return to nativism and rejection of the other, how interesting to read of a state that was extraordinarily multicultural and that survived for 300 hundred years before falling to colonial conquest, not internal contradiction. The sultans of Darfur were Fur and Muslim, their subjects a medley of different groups with a variety of languages, religions, and self-identifications (the Fullani or Peul, for example, who don’t speak Arabic, regarded themselves as Arabs and traced their origin to an Omayyad general); the sultan held court with seven interpreters between him and the people (a bare minimum, as even today more than a hundred languages are said to be spoken in Darfur). Fur culture has a vivid presence within this Arabic text: words, phrases and song in the language of the Fur are transcribed by the author, sometimes without translation. The sheer exoticism of the state and its customs also caught my fancy: dull would s/he be of soul who could resist a country where one of the chief officers of state bore the title of the Sultan’s Buttocks (his military formation brought up the rear when the army was on the march) and where the court jester was also “the Keeper of the Sultan’s Anger,” i.e., was the executioner. Finally, this is the product of a most unusual cultural collaboration, between two savants, one Arab, one French, at a moment of convergence that preceded much of the angst that would follow with the spread of colonialism in Africa. MLQ: How much do we know about how the work was composed (and why), about the power relationships involved, and how much is speculation? I deduce from this that the shaykh wrote down material that he then dictated to Perron as an exercise and which they probably then discussed and which the shaykh would have elaborated on, with Perron taking notes. The fact that Perron’s notes were the product of an oral process would partly explain the colloquialisms and the generally rough-hewn style; the fact that Perron was a student and not a native speaker would explain the rest. Perron then organized and perhaps rewrote his notes and had the shaykh review and sign off on them. The process would have been close in essence to that followed at teaching institutions such as al-Azhar, where a student would read a text with either its author or a qualified scholar with the aim of receiving the latter’s license to teach it himself. However, while Perron was the shaykh’s student, he was also his superior, first as a member of the teaching staff of the Medical School where they both worked and later as its director. This may well have inhibited the shaykh from being too rigorous in his corrections and thence to the perpetuation of the mistakes that al-Shidyāq would later condemn (al-Tūnisī edited for the Bulaq Press texts as difficult as al-Ḥarīrī’s Maqāmāt; al-Shidyaq was right: he wouldn’t have committed these solecisms himself). In a further divergence from tradition, the goal (from Perron’s perspective, at least) would have been to clarify and enlarge on the author’s original notes, in collaboration with the latter, rather than to reproduce them faithfully. MLQ: So Perron was certainly an active player in the creation of In Darfur, and not just a transcriber. How do you characterize his relationship to the text, and to what extent might he have shaped its creation? HD: Perron describes himself in his foreword to his translation, Voyage au Darfour, as having “instigated, pursued, and brought about this production in written form” and that seems justified. He did, after all, ask al-Tūnisī to write it and then copied it out for publication; without him it would not have seen the light. On a deeper level, one might wonder how much the author’s having been embedded in a western scientific institution, and his work, with Perron and others, on its intellectual products, may have influenced his approach to its composition. Perron states (see above) that he left both the form and the “judgments” of the book as the author expressed them. This claim is bolstered by the fact, for example, that he records the author’s bald statement that “rarely…is a chaste woman to be found among the Blacks” even though he clearly felt uncomfortable with it: in his translation, we find instead at this point a paean to the purity of Arab women. 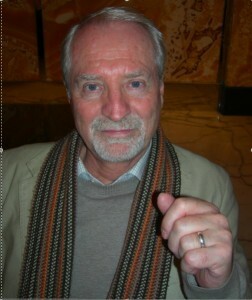 The author’s approach in the second part of the work (“the Book Proper”), in which he describes “Darfur and Its People [and] Their Customs,” has the ring, to me at least, of a European ethnographic work of the time, though humanized by the many personal anecdotes with which the author illustrates his text. MLQ: How do you imagine the audience of the original text? Why do you think he would’ve made a point, in the preamble, of this being an easy read? HD: Only around a hundred copies of the original lithograph were produced, so Perron, at least, does not seem to have regarded an Arab readership as his main target. In contrast, the French translation went into 20 editions and an English translation (abridged and covering both this and Perron’s translation of the author’s work on Wadai, which has never been found in Arabic) appeared almost immediately, in 1854. The Arabic was used in Paris for teaching Arabic (again): al-Shidyāq observed it being taught (and mangled, naturally) by the leading French Arabist Armand-Pierre Caussin de Perceval, probably at the Institut national des langues et civilisations orientales. The possibility of it being adopted in such schools may have lain behind Perron’s desire to see the book in print. The intended market cannot, however, have been exclusively European: even though the number of copies was so small, it included two different versions, one, with some material in French, presumably for the European market, another, without any French, presumably for the Arab market. Al-Tūnisī’s assertion that he has “spared no effort to make it clear, and not gone diving after arcane words” may be pre-emptive, in that he knew that the style used with a foreign student in mind might seem less elegantly literary than critics would have liked, though he does display his erudition early on with a volley of puzzle-poems. MLQ: How would al-Shidyaq have come across it? Would he have originally come across the Arabic or discovered it through the French? HD: Al-Shidyaq seems to have observed Caussin de Perceval teaching it in Paris, as mentioned. This may have been when he first became aware of the book, though it’s also possible that he saw it at the offices of the printer who prepared both al-Tūnisī’s work and his own Leg Over Leg. He makes no reference to the French translation, so I doubt if he knew of it. MLQ: This book (and Voyage au Ouadây) seem to have advanced Perron’s career and repute. Did they change anything for al-Tūnisī? 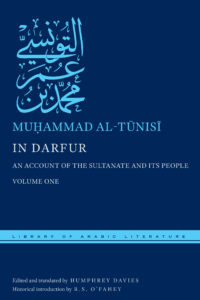 HD: We know little of al-Tūnisī’s later life, beyond the fact that he prepared editions of the Arabic classics for the Bulaq Press, which implies recognition of his philological skills, and that, at the end of his life, he gave lessons at the mosque of Sayyidah Zaynab, which implies recognition of his piety and standing in the community. MLQ: What do you think are the most significant differences between the French and the Arabic versions? The one you mention, about the chastity of women? HD: I haven’t read the translation from beginning to end, but the greatest difference, it seems to me, are not the odd complete divergence from the original, as in his dealing with the author’s comment on “the women of the Blacks,” but Perron’s anxiousness to ensure that his French audience understood the material, manifested in his frequent use of the French translation to gloss rather than simply translate the Arabic. This is in addition to the extensive notes and appendices in which he provides additional explanations and expatiations that were often, as he underlines, taken directly from the shaykh.